Satellites keep an eye on ice loss and gain in Alaska. 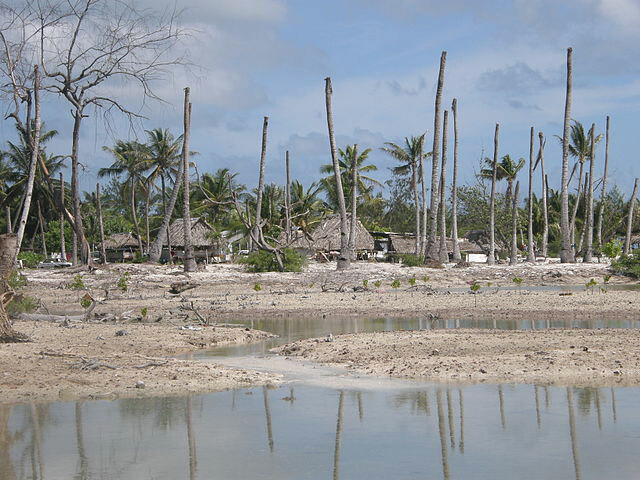 In the low-lying Pacific island nation of Tuvalu, sea level rise is taking a toll. One of Tuvalu’s uninhabited islands disappeared under the waves in 1997. And now, rising seas frequently flood the airport runway in the capital, Funafuti. New houses must be built on stilts. Tuvalu’s prime minister, Enele Sopoaga, worries about the future. He wonders whether his country will survive, or whether it will disappear under the sea. One third of sea level rise comes from thermal expansion, which occurs as warming ocean water expands slightly. The remaining rise comes from melting land ice. It is tempting to blame the vast Antarctic and Greenland ice sheets, as they contain 99 percent of all land ice on Earth. Yet they currently only contribute a third of sea level rise. The remaining third comes from mountain glaciers, such as those in Alaska, the Andes, and the Himalaya, which combined contain a mere 1 percent of land ice. Evan Burgess, a researcher at the University of Utah, is trying to understand how such small glaciers can have such a big impact on sea level. Higher temperatures may seem obvious, but understanding glacier melt requires a more complex equation. Burgess said, “What matters is the glacier’s net change in mass, and that’s a combination of melt, snowfall, and calving. So you have to take into account all three.” A glacier’s status is measured by its mass balance: whether it is building mass through snowfall, losing mass through melt and iceberg calving, or remaining stable. By focusing on Alaska’s glaciers, Burgess helped solve an important part of that equation. Glaciers across Alaska have been retreating, and researchers have yet to discern what exactly is behind the melt. 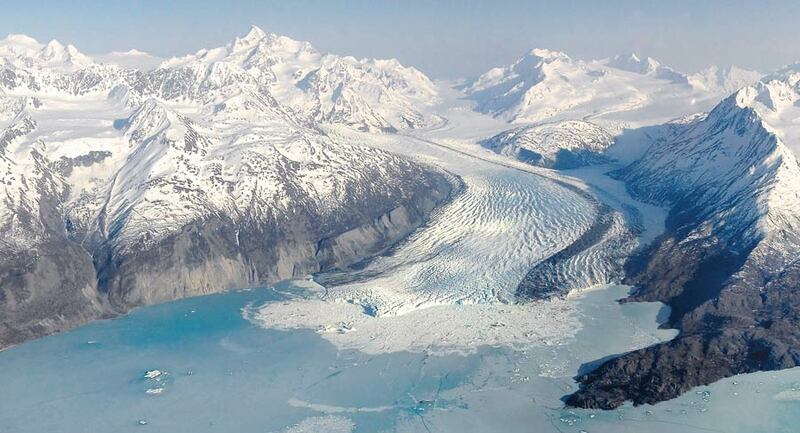 Complicating matters, most glaciers in Alaska terminate on land, while others—called tidewater glaciers—terminate in the ocean. “What we don’t know is whether those glaciers are changing because of a change in the atmosphere,” Gardner said. “Or are those glaciers responding to something that’s going on in the ocean?” Rising air temperatures may cause region-wide retreat of glaciers, while warmer oceans can force tidewater glaciers to calve more ice and retreat. Untangling why Alaska’s glaciers are melting may help explain why glaciers around the globe are retreating. Researchers also must tackle unique obstacles posed by regional climates. A variety of satellite instruments can monitor glacier speed, but few can see through cloudy, wet weather. Because Alaska gets a lot of rain, Burgess chose data from the Phased Array type L-Band Synthetic Aperture Radar (PALSAR) instrument on the Japan Aerospace Exploration Agency and Ministry of Economy, Trade and Industry Advanced Land Observing Satellite (ALOS). The ALOS PALSAR data, although copyrighted by JAXA/METI, are made available through NASA's Alaska Satellite Facility (ASF) Distributed Active Archive Center (DAAC) to NASA scientists due to the strong partnership developed between JAXA and NASA. Burgess said, “L-Band radar, such as used by ALOS, is less sensitive to water, which allows us to track the glacier over a longer period of time. It makes the algorithm more robust to changes in weather.” Tracking the glaciers with PALSAR data allowed Burgess to see persistent patterns in the glaciers. To find ice velocity, Burgess selected two PALSAR images of each glacier taken on different dates, and compared them using offset tracking. “Offset tracking is basically just pattern matching,” he said. “A computer algorithm searches for the same feature in two images acquired forty-six days apart.” Although the satellite views the same spot on Earth repeatedly, it does not acquire images from exactly the same location, so Burgess corrected for the slight differences in the images. “We look at land areas that aren’t moving and see how much shift there is from one image to the next and we correct, or pull that shift out, so that the two images are perfectly lined up,” he said. Any remaining movement in the image pair reveals how fast the ice has moved. Using these comparisons, Burgess created the first-ever maps of Alaskan glacier velocity, a baseline for future changes. And because he looked at wintertime glacier velocities, he made an unexpected find about glacial motion: summer melt influenced winter flow speeds. During summer, melt water drains through glacier ice, lubricating the glacier bed. But over the summer, this same water bores tunnels in the ice, allowing the water to drain from the glacier in the fall. “We found that in summers with more melt, better channel development helps glaciers drain better and reduces flow speed of glaciers throughout Alaska come winter. This upends a widespread understanding throughout the community that glacier velocities in winter don’t really change,” Burgess said. His research also suggests that unusual increases in summertime glacier velocity from summer melt are largely countered by slower ice velocity the following winter. Even after tidewater glaciers become land-terminating glaciers, their melt water ends up in rivers that eventually run off into the ocean. Keeping an eye on ice velocity and mass balance will help researchers project sea level rise and gain more insight about the climate forces acting on glaciers. Sea level rise remains complicated, a tangle of processes gradually reshaping the world’s coastlines. “When it comes to century-scale sea level change, which is important to us as a society and to the engineering of coastal communities, these regions are very important,” Gardner said. Burgess, E. W., R. R. Forster, and C. F. Larsen. 2013. 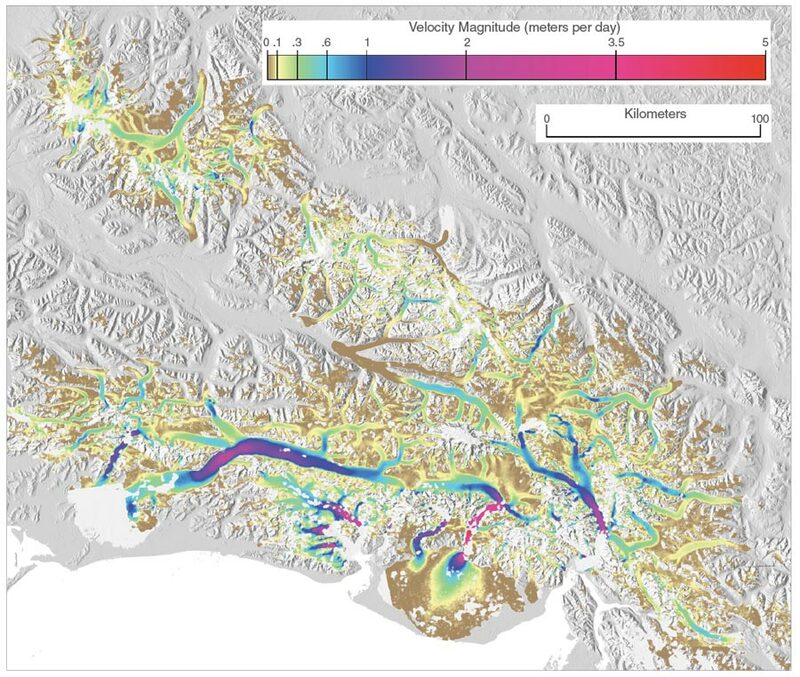 Flow velocities of Alaskan glaciers. Nature, doi:10.1038/ncomms3146. Burgess, E. W., C. F. Larsen, and R. R. Forster. 2013. 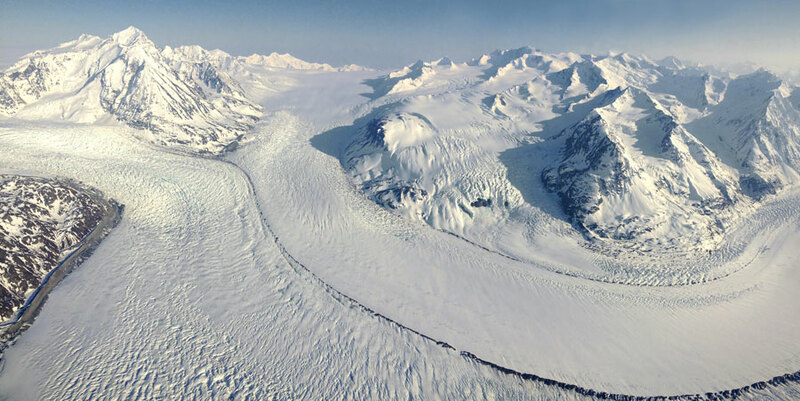 Summer melt regulates winter glacier flow speeds throughout Alaska. Geophysical Research Letters 40: 6,160–6,164, doi:10.1002/2013GLO58228. Gardner, A. S., G. Hoholdt, J. G. Cogley, B. Wouters, A. A. Arendt, et al. 2013. A reconciled estimate of glacier contributions to sea level rise: 2003 to 2009. Science 340, doi:10.1126/science.1234532. NASA Alaska Satellite Facility (ASF) Distributed Active Archive Center (DAAC). 2012. ALOS PALSAR data. Copyrighted by JAXA, METI. Fairbanks, AK, USA: NASA ASF DAAC. https://www.asf.alaska.edu/sar-data/palsar/about-palsar. NASA Land Processes DAAC (LP DAAC). 2012. Advanced Spaceborne Thermal Emission and Reflection Radiometer (ASTER) Global Digital Elevation Map (GDEM). USGS/Earth Resources Observation and Science (EROS) Center, Sioux Falls, SD. https://lpdaac.usgs.gov/dataset_discovery/aster/aster_products_table/astgtm. Warne, K. 2015. Will Pacific island nations disappear as seas rise? Maybe not. National Geographic, http://news.nationalgeographic.com/2015/02/150213-tuvalu-sopoaga-kench-kiribati-maldives-cyclone-marshall-islands.